Michele Brody takes the widest possible context for her work: the social, cultural, and natural environment. Since the mid-1990s, she has been working on a series of collaborations with nature: installations and sculptures that use flax, grass, herbs, and plants native to a specific site as essential sprouting, growing, and withering elements of the work. Various installations have mounted these growing elements in or on fabric, plastic, or glass structures that both present and isolate the encapsulated nature. The resulting works are highly artificial and starkly contradictory environments, sometimes minimal and rigid and sometimes flowing and supple, that isolate rather than cultivate the natural forms. 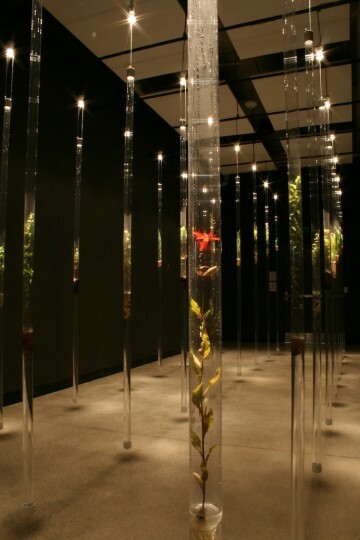 The first of these works that I encountered was Nature Preserve, a beautiful and disturbing landscape of plant cuttings growing in tall tubes that are lit from above. It makes a forest that is artificial, that is on life-support, that engages the viewer both visually, standing in front of or walking through this artificial forest, and it also engages intellectually, about the environment and environmental issues. Nature Preserve is a visually, intellectually, and emotionally engaging piece, and an indication of the scope and depth of the artist’s work as a whole. In other works, such as Looking Out, Seeing Below from Above, or Land-Scaping, she has brought together growing plants with forms made of soft fabric or solid architectural materials, embodying the range of human experience from city-building to sewing, from urban life to private life. Brody has also used a highly cultivated and processed plant form, tea, as the germinal focus of social-interaction works in gallery, community, and public spaces. Tea is as much a social relation as a natural product, and Brody exploits the ceremonial and interactive aspects as well as the ability of brewed tea to act as a dye or stain. CommuniTea has brought all these possibilities into locations all over New York City, providing a sculptural site in which performance, spoken-word art, and community gatherings take place within a room-sized quilt made of hundreds of used teabags. A third strain of Brody’s recent work focuses on the built environment of historical neighborhoods, in sculpture and public art varying from cast-iron manhole covers referring to local and historic landmarks (both architectural and natural) to translucent paper panels that pay tribute to the present and the past (and the possible future) of these sites by not only representing the current (and rapidly gentrifying) man-made structures but also including natural elements, such as seeds. Her recent Harlem Roots is a glowing, ghostly evocation of ways of life, before gentrification and before human habitation, in poetic juxtaposition with daily life in the present. Brody weaves together history and culture, experience and form, in works that engage us aesthetically and socially and inspire us to consider the whole living context for our present life and future prospects.